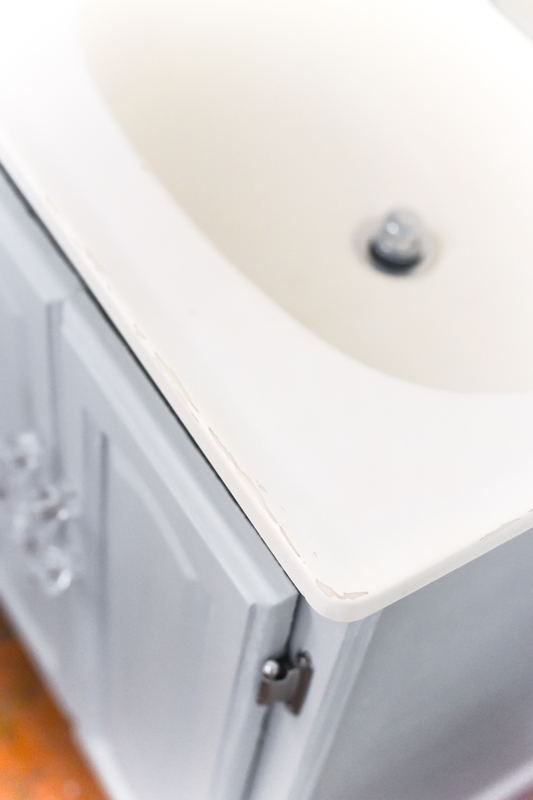 The Painted Sink: Where Is It Now? 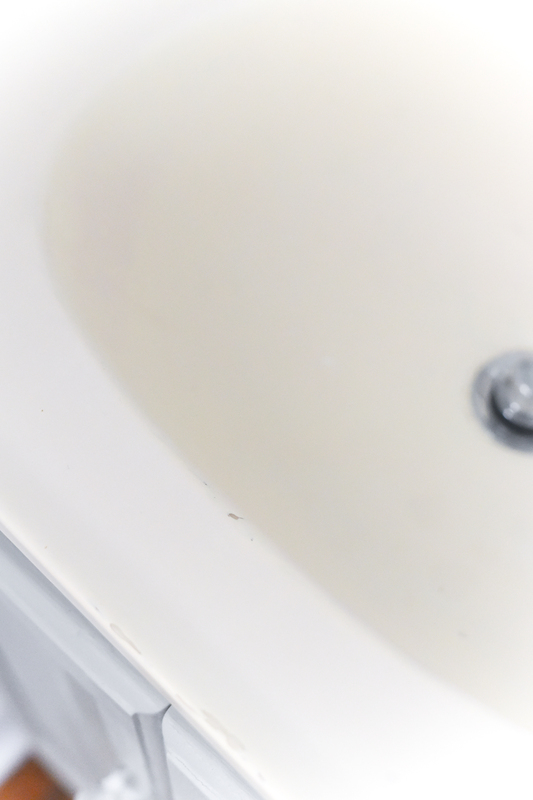 – How To Paint a Sink. and here in the powder room in early 2011. 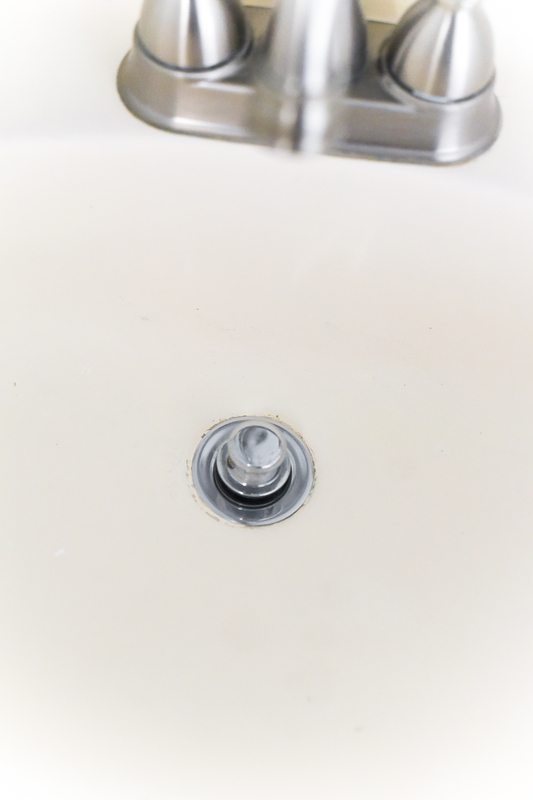 I’m often asked how the sink has held up over the years. And let me tell you: Here in the powder room, it’s held up pretty well. 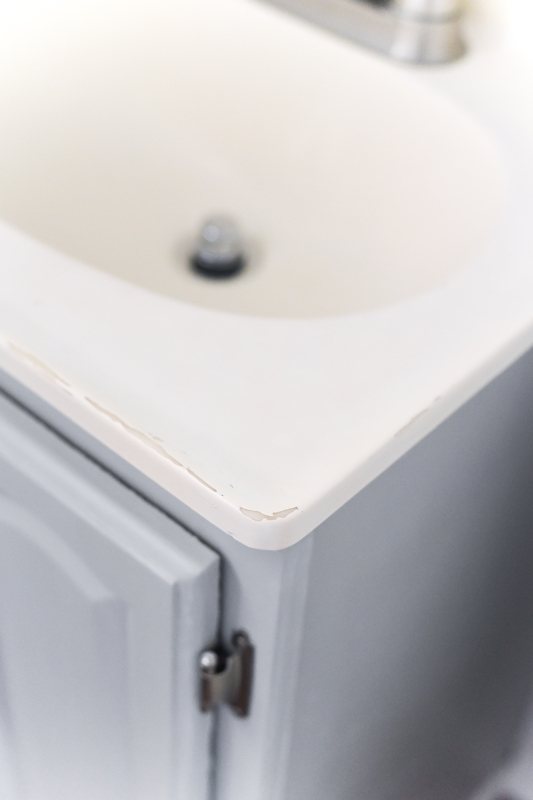 Especially since I painted this sink close to eight years ago, and I’m 99.99% sure the paint-the-sink product box stressed this should not be intended as a long term solution. I’m 99.99% sure the shelf life should be closer to five years or so. You know, temporary. A temporary solution to mask the ugly until you get around to a permanent solution. But guess what? There will be no permanent solution. In our Chicago neighborhood, our home is considered a tear down. Which leaves me with 00.00% motivation to invest in anything that I can’t take with me. So my only option is to live with some nicks and knacks. You can see some scuffing along the edges. Here’s a closer look. You can see how the paint is being peeled back, exposing the ugly fiber glass underneath. Oh, and the color has yellowed a bit over the years. 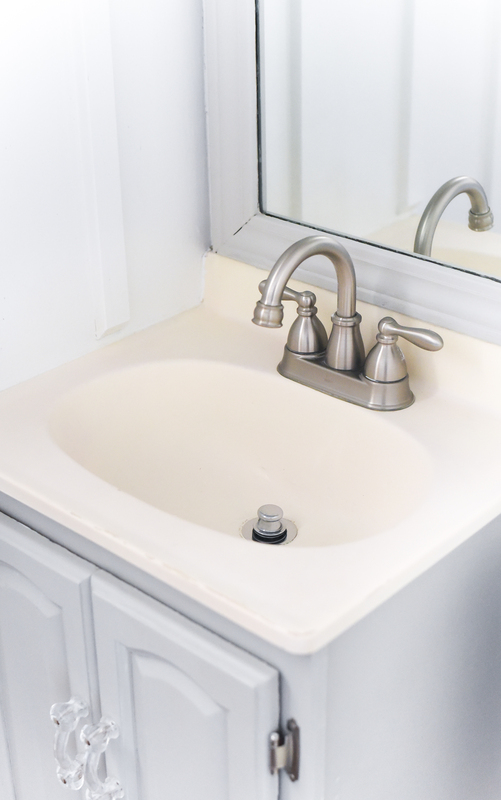 at the end of the day it’s still a whole lot better than the faux fiber glass biege/orangy builder grade sink that was all the rage in the 90’s. 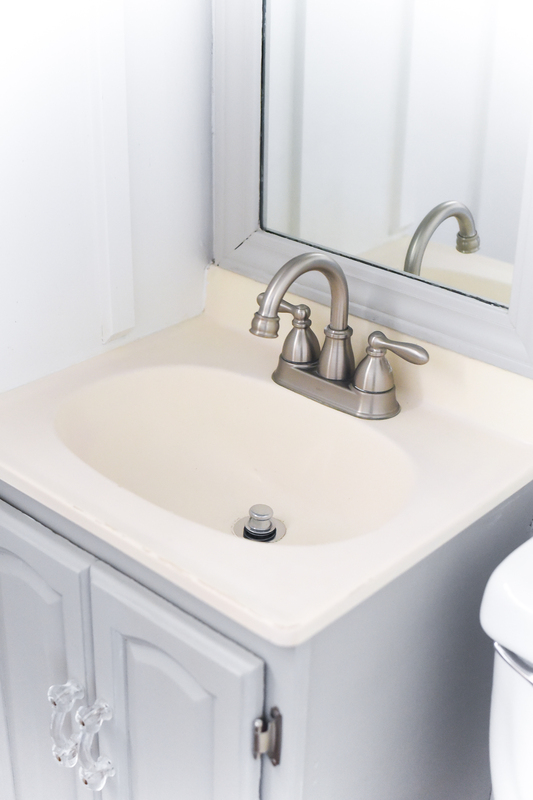 Faux fiber glass beige/orangy builder grade sinks were never a rage. At any time in the history of the U.S. Or the history of the world, for that matter. Just a cheap option in the world of builder grade flipping. 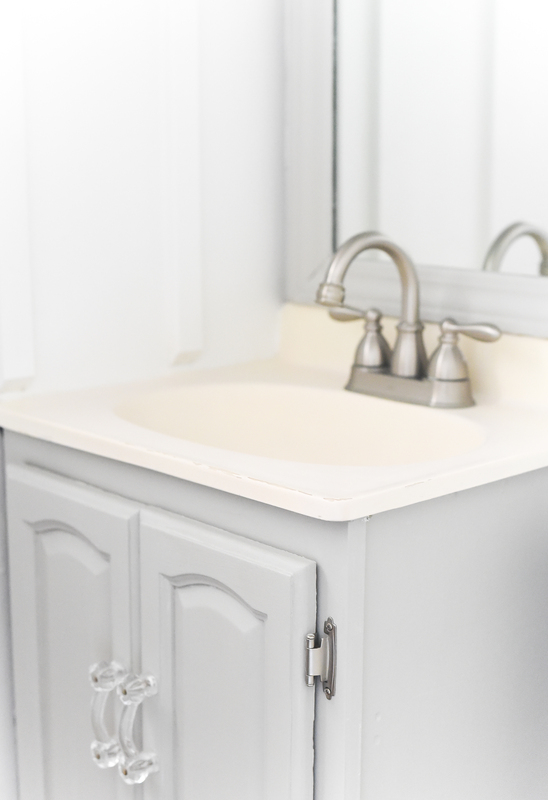 Which has me thinking: exactly who are these builder grade designers that thought a faux fiber glass beige/orangy sink is just what a homeowner would want? Still looks ok I think. It was a great idea to paint it! I don’t know, our bathroom sinks are MarbleLike. That’s what the product name is according to the label still on one of them. Well It doesn’t look anything like marble. It’s just a yukky orangey peach colour and I’m sure it was just as ugly the day it was installed as it is now. LOL. However it’s still in perfect condition and is the right size for a very small bathroom, so it’s staying. I guess I’m not as brave as you, as I can’t see myself painting it. You sink looks great considering how long ago you painted it. What a great alternative to tearing the whole bathroom apart!